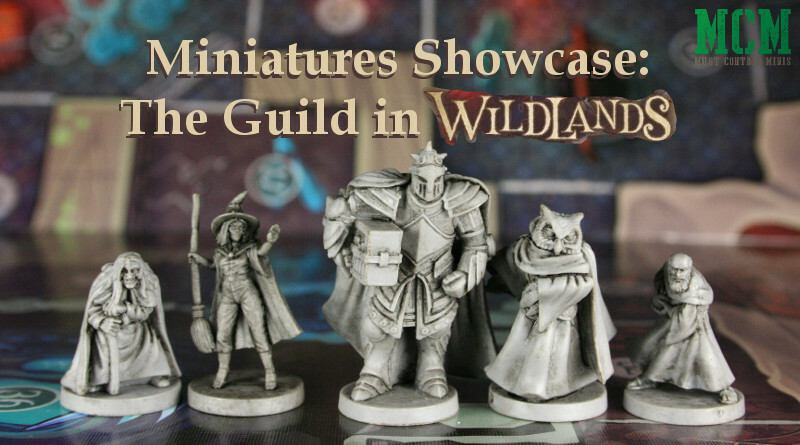 In this post, we take a look at the miniatures of the Guild in Wildlands by Osprey Games. For those that don’t know, Wildlands is Osprey Games first miniatures board games. I’ve been really excited to take a look at this game for a long time now. In it, you play as a faction in search of magical crystals in what could be described as a post-apocalyptic fantasy world. 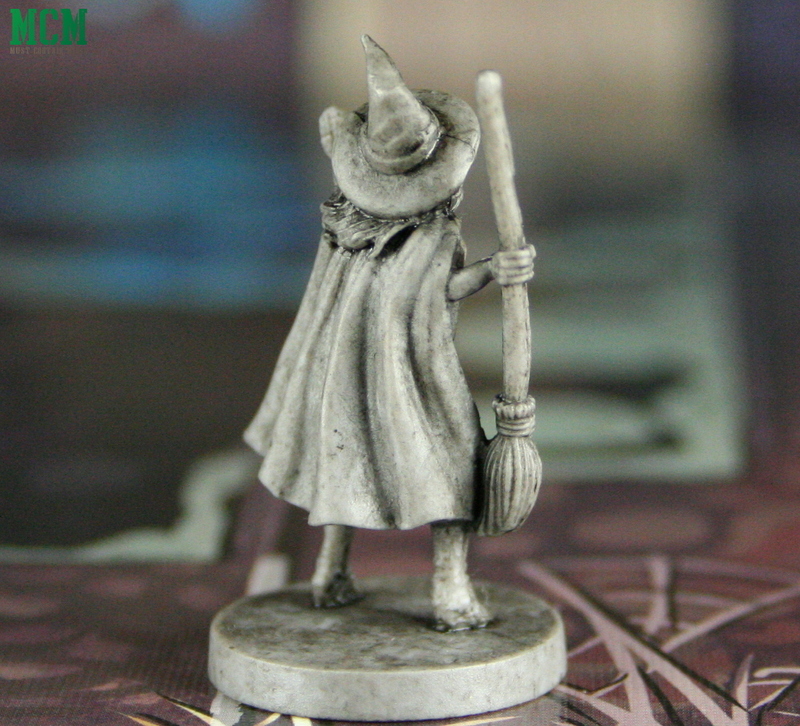 Here, we focus in on the Miniatures of the Guild faction, which is the group of mages looking to protect and preserve magic. This post is not a review of the game, but rather a review and showcase of the miniatures in the core game box. 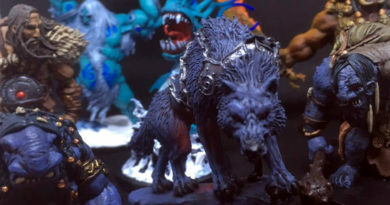 The core box comes with 20 miniatures and in this article, we take a closer look at five of them. The game itself is fairly simple and contains no dice mechanics. For those interested, I included scale comparison pictures at the end of the article. Now, let’s take a closer look at the figures in Wildlands’ Guild Faction. For the sake of full disclosure, Osprey Games sent MCM a copy of Wildlands and The Unquiet Dead Expansion. Thank you very much for sending this along. The game looks great so far. The mages are powerful and have more “area attacks” than the other factions. These attacks damage all units (friend or foe) in an adjacent target space. The Guild happens to be light in defense, but there is a faction worse than them on that front. A second group shot of the Guild Miniatures in the Wildlands four-player starter set (the base game includes all that you need for 2 to 4 players). 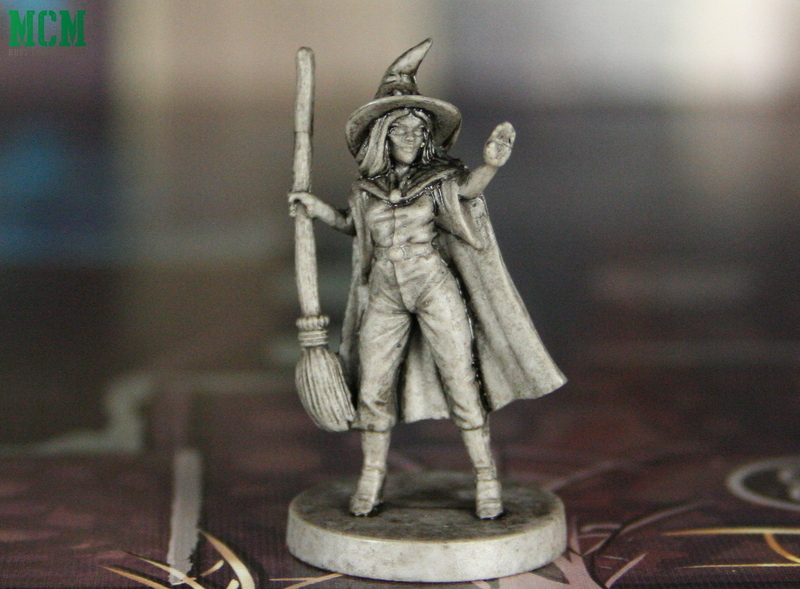 Right off the top, I have to say that I was impressed to see that these miniatures came pre-washed in ink. What a nice touch! I had to do nothing to them to get them looking this nice. They came out of the box like this! Edith is a fairly well rounded character. She has the ability to fly, a couple of melee attacks and a few Area Attack cards. This is Edith the Witch. A nice looking mini. Edith from another vantage point. Looks great out of the box and it should paint up well too. This is Garen. Garen avoids hand to hand battles, but excels in area attacks. I really like this mini! This is a cool looking mini. I have visions of him also making an appearance in A Fistful of Kung Fu sometime. Garen from head on. If he is looking at you, run and spread out! Don’t get caught in a group in any squares areas adjacent to this guy! This guy looks pretty cool! Hugo is an anthropomorphic owl. He is the Guild’s second best melee fighter (still not very good) and their best character in defense. He also happens to be able to fly. Be careful though, he can’t take as many hits as his allies. 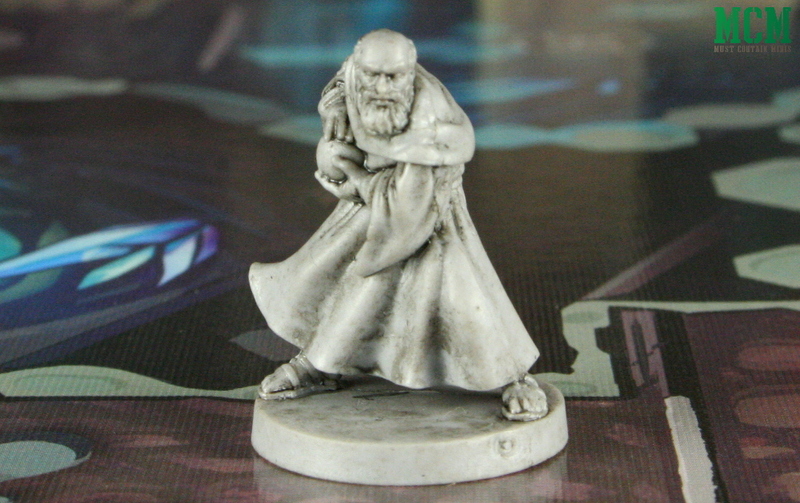 When I first saw this mini, I thought he might be good for Badgers and Burrows. I still think that, but the box comes with fewer anthropomorphic creatures than I expected. Not a bad thing in my opinion. Still a very cool mini! Gretchen is a little stronger than Garen in hand-to-hand combat, but just as good as Garen at Area Attacks. Watch out for her. She is more powerful than she appears! This is Gretchen. She may be frail, but she can fry full groups with her powerful magic. Be careful around her! Lunk is the Guild’s mobile librarian. He carries magical books and scrolls for the group, but is not as good as the others at area attacks. Instead, he is the group’s only good melee character. He doesn’t have much in defense, but he is a tank. He has a ton of hit points! Lunk carries all of the Guild’s library materials with him. Stay clear. He hits hard if you get him into a fight. 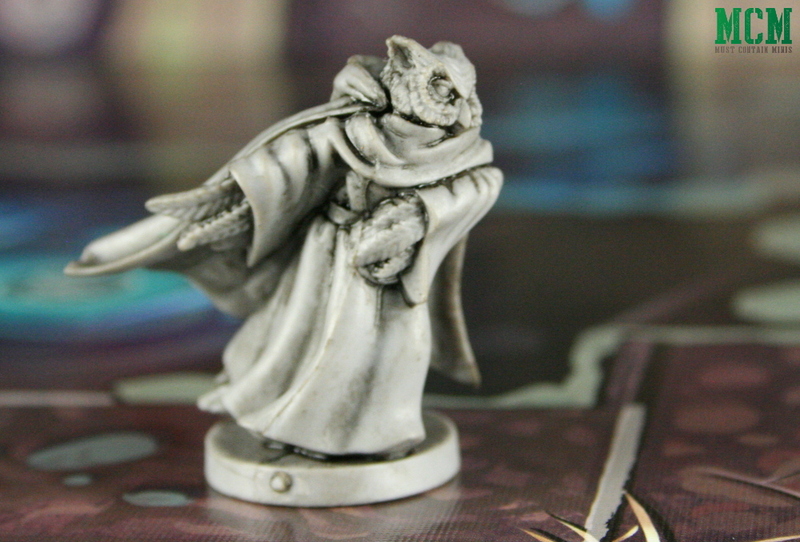 I like the other minis of the Guild better than this one, but Lunk has some appeal to me for some reason. 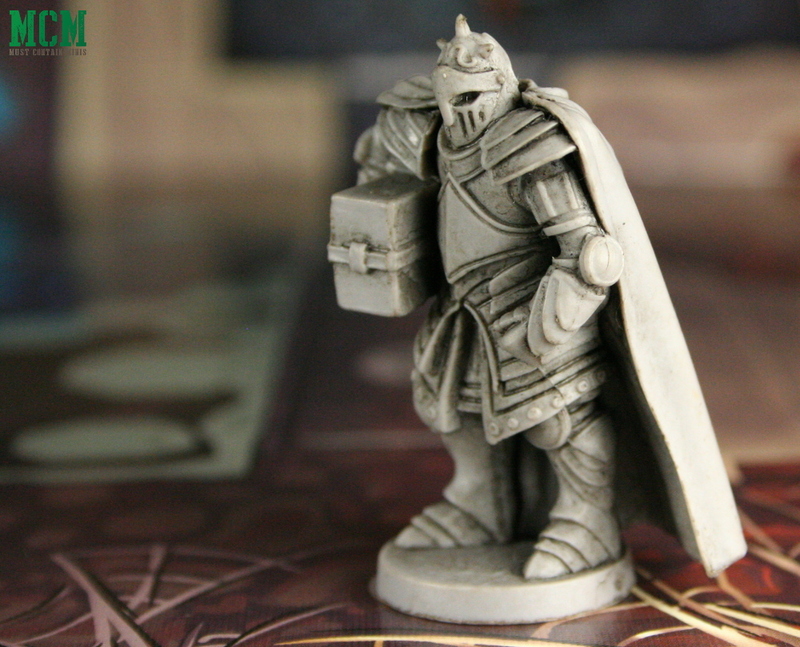 I know what I like about this mini now… He looks like Alphonse Elric (Al) from Fullmetal alchemist. Cool! 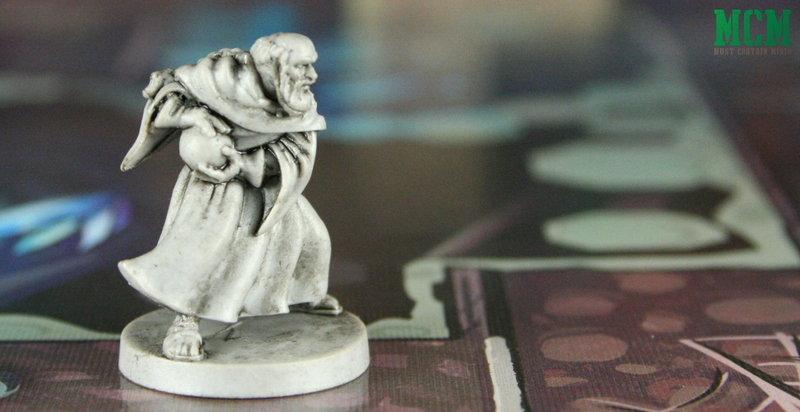 Quality wise, I was not sure what to expect with Osprey Games’ first board game miniatures. 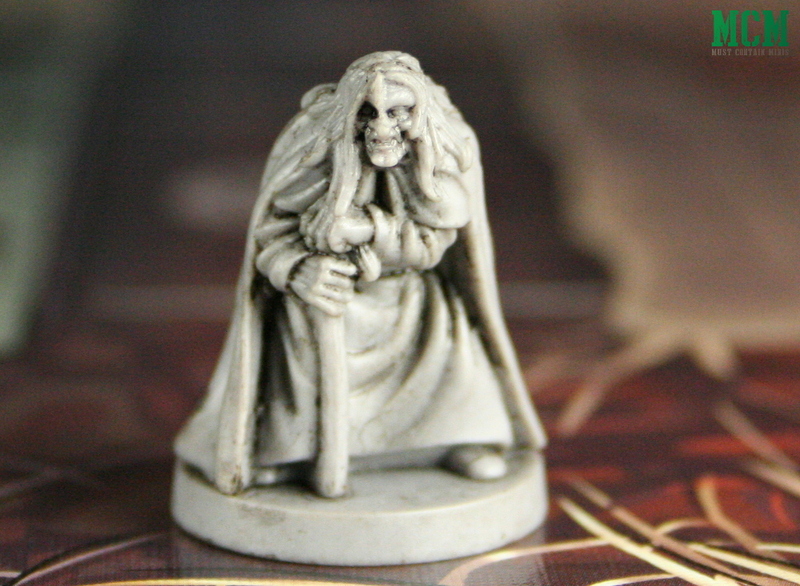 The minis are made of a softer plastic than the hard plastics of Frostgrave. That said, they soft plastic is in great shape. None of them require bending in any way. Most times I receive soft plastic minis, I have to bend some of them back into shape with hot water. This is not the case with my copy of Wildlands. 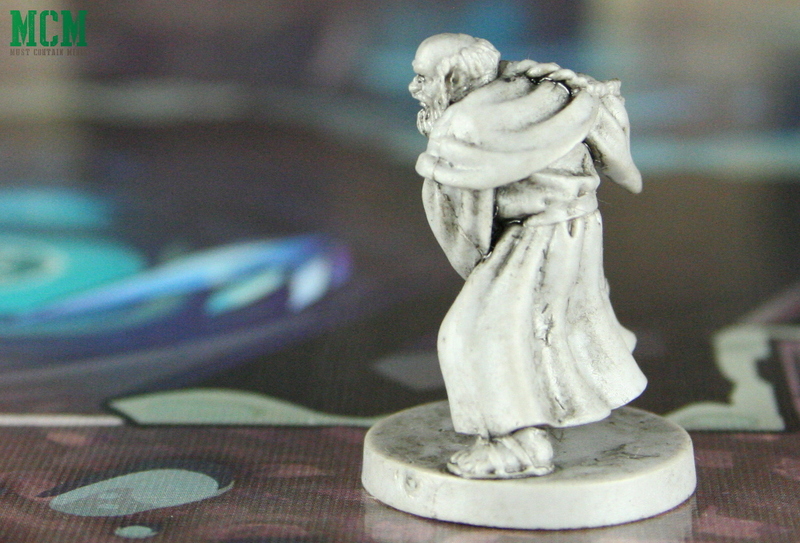 Another great thing about these miniatures is that they come pre-washed with ink. I didn’t have to do anything to them to tint or shade them. They came out of the box looking this good! To me, this is a really nice touch! Thanks Osprey! Finally, the miniatures come in some really protective packaging and will store away nicely in the box they came in. For me, this is a huge plus. Although, I could see why some people might not like the packaging. If you are the type of person that likes to consolidate all of your expansions into the core game, you will see less value in the game’s packaging than I. Now, let’s take a look at how the miniatures scale up to other companies. Above we have the grey miniatures from Wildlands size compared to (left to right) a North Star Military Figures’ Frostgrave Necromancer Apprentice, a 32mm Reaper Miniatures’ Cultist, and a Frostgrave Plastic Cultist. Notice how much taller Lunk is in the background. Let’s take a closer look at him. Lunk is huge. Left to right, we have a Sig-Marine, Lunk, and a Frostgrave Apprentice. Scale-wise, they match up okay with 28mm figures. The minis from Wildlands may be a little shorter or truer to life in their proportions, but I wouldn’t think twice about also using them in other 28mm skirmish games. Also, if you are a painter, the comparisons above should give you a good indication of the size of the minis in the box. 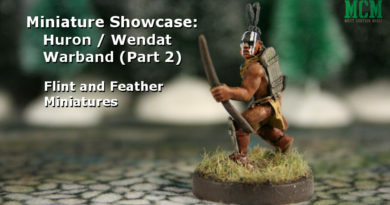 Hopefully you enjoyed this Showcase and Review piece of the Guild Miniatures within Osprey Games’ Wildlands by Martin Wallace. The game itself is fairly simple, and to me that can be a charm. 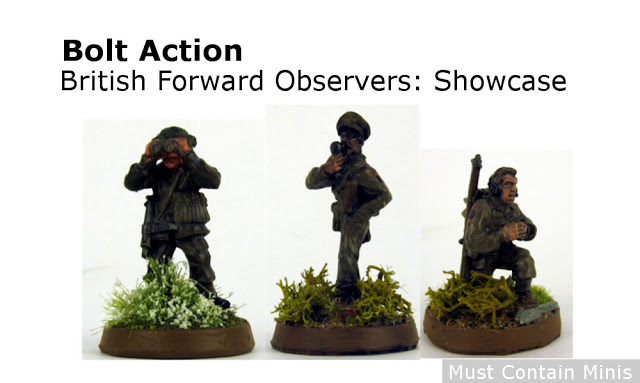 We will get into game play in a future post, but first we will take a closer look at the miniatures of the other factions too. Thanks goes out again to Osprey Games for sending MCM a copy of Wildlands and The Unquiet Dead Expansion for review purposes. 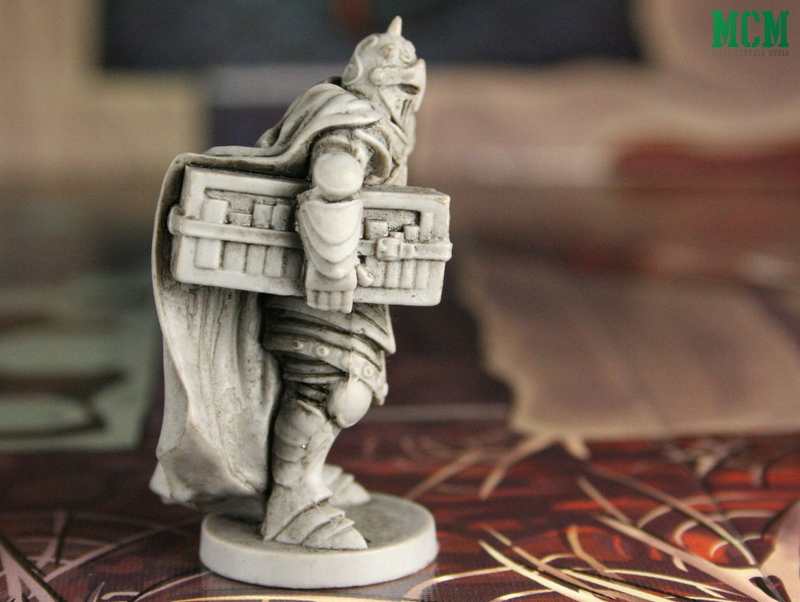 Do you have a Miniatures Game that you want use to Showcase or Review? 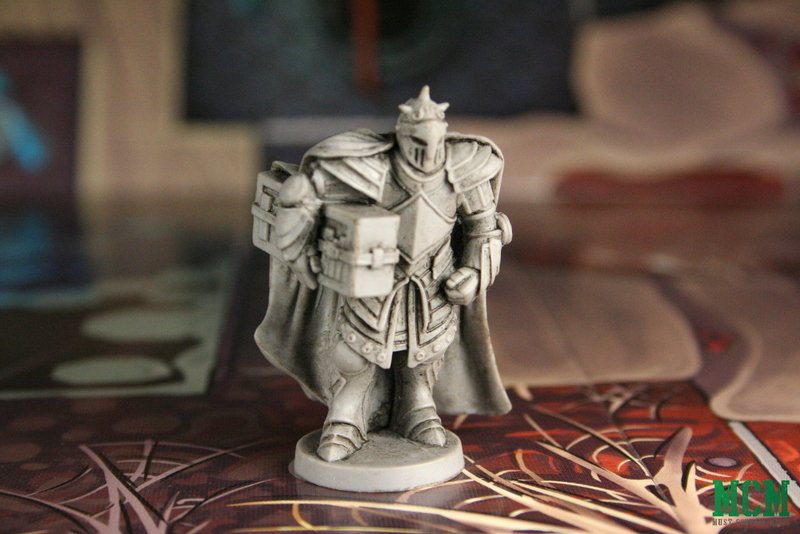 If you are a company, or know of a company, that makes miniatures board games that would like to receive similar treatment for their game, please have them check out our Sponsorship and Review Products’ Page and have them contact me at mustcontainminis@gmail.com. Thanks for the overview. I was curious about this exact subject, and blam! There is was. Glad you enjoyed it BDub. Part 2 just went up today.